Bill and Amanda Belichick, center, joined Mike Whalen, the Frank V. Sica Director of Athletics; Board of Trustees Chair Donna Morea ’76, P’06 and Wesleyan President Michael Roth in a ribbon cutting ceremony to officially acknowledge the newly-named Belichick Plaza. 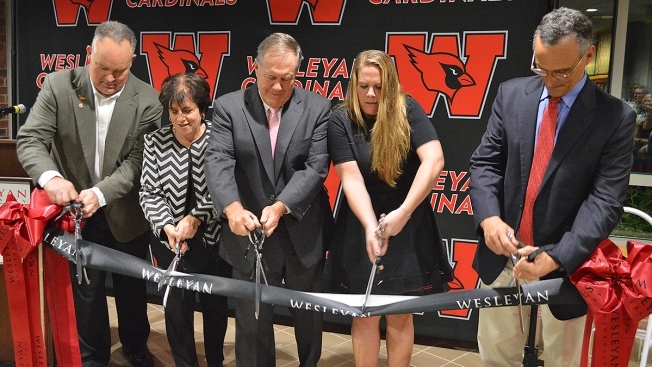 The five-time Super Bowl winning head coach of the New England Patriots was at Wesleyan University Friday when school dedicated the entrance to a school building to Bill Belichick and his daughter, Amanda. Bill Belichick graduated from Wesleyan University in 1975 and Amanda graduated in 2007. A post on the Wesleyan University Facebook page says the dedication is in honor of the leadership and generosity of the father and daughter alumni. Wesleyan officials dedicated Belichick Plaza Friday during Wesleyan’s Homecoming and Family Weekend. The school also presented Bill and Amanda Belichick with personalized Wesleyan sweatshirts. Any Patriots fan knows that Bill Belichick is famous for cutting the sleeves on his sweatshirts and the university brought scissors to get the sleeves on the new sweatshirt right where he wanted them and make it a true Belichick hoodie. See the video on the New England Patriots website. Belichick Plaza is located at the Warren Street entrance of the Freeman Athletic Center and it’s home to the Wesleyan Athletics Hall of Fame, which Bill Belichick was named to in 2008. Amanda Belichick was captain of the lacrosse team and served as head coach of women’s lacrosse at Wesleyan from 2013 to 2015. See more photos of the dedication.